There's 1 comment so far. Last comment was posted 8 years, 2 months ago. 10:30am (now on Friday) – We found out the the Tales breakfast at Brennan’s was way over-RSVP’d and that if we hadn’t signed up, we should search elsewhere to soak up all the drinks from the previous night. A quick Google search revealed Cafe Du Monde. Their menu was simple: beignets, cafe au lait, and well, that’s about it. Walking up Saint Ann St. we passed countless breakfast joints, but none were packed, not even the ones that looked exciting. When we arrived at Cafe Du Monde, we saw why. Everyone was there. A huge covered patio was filled to capacity with tables and chairs, hungry people, and beignets. The floor was powdered with white as if a snow storm had suddenly come out of no where. It came from the beignets which were doused with sugar. Honestly, there was literally 1/2c of powdered sugar on every serving of them. If you aren’t familiar with beignets, they are pretty much a French deep-fried donut. I’m not sure why they are French; maybe because they’re square. We guzzled down coffee and chicory filled with hot milk and a serving each of the beignets. I think I’d be happy eating that exact meal every day of my life. 6pm (still on Thursday) – The cocktail hour was packed! There were close to 50 tables set up serving various concoctions and tasty morsels. One of the first people we bumped into was Paul. I was surprised to see him behind the table, shaking up drinks. I found out later that he was surprised to be there too. I won’t take away his fire, though, as I’m sure he plans to write about how he ended up mixing up 300 Procrastination Cocktails. 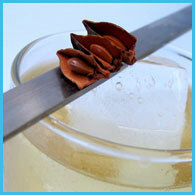 Stir ingredients with cracked ice and strain into a chilled glass. 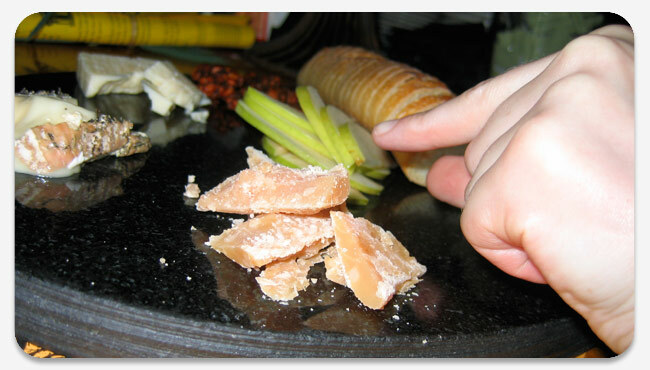 Garnish with a strip of lemon peel. Other notable folk were mixing up drink, from David Wondrich to Kevin Brauch. Ted Breaux was also there with Lucid, the new absinthe available in the states. From a non-expert’s point of view, it was both mild in flavor, yet quite tasty. The Beachbum was there as well, but I was sad to see that he didn’t have some wild and crazy rum potion for us to try. 8:00pm – Paul, Darcy, Gretchen, and I taxied over to the Delachaise. At first glance, it looks little more than an old diner. Chalkboard signs fills the windows promising fresh New Orleans tomatoes and that they are open late. We walk in and are met by a totally different scene. A long bar runs nearly the length of the whole restaurant and there are plush seats and tables at either end. The lights are low (see crappy pictures below) and the tunes are groovy but unobtrusive. We are immediately greeted by Chef Chris and shown to our seats at the bar. It’s immediately obvious that Chris went out of his way to make this Spirited Dinner special. 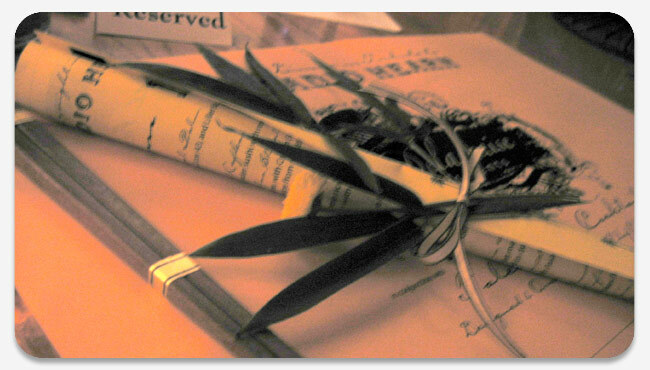 The place settings are designed just for the event, including an elaborately scroll containing our menu. Within minutes we are treated to our first drink, The Tropical Palm. It was served in a shot glass with a twist of lemon and contained the new Absolut New Orleans which is flavored with mango and pepper, Licor 43, and Lillet Blanc. There were only sixteen of us being treated to the dinner, so it was quite cozy. 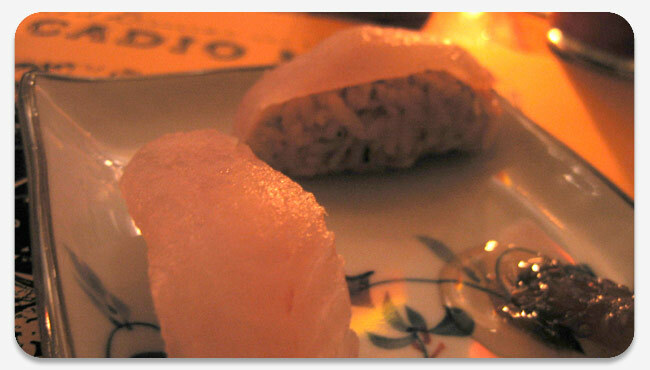 The first course came out … an Amuse-bouche of flounder sushi with rose petal rice. To accompany it was a house-made ginger beer with Cruzan Single Barrel rum. It’s name was the Tchoupitoulas St. Guzzle and claimed to be an old 1850s New Orleans recipe. The balance of the sweet rose-flavored sushi and the spicy ginger of the cocktail was phenomenal. It’s a good time to point out that Gretchen opted out of the tasting menu since she is a vegetarian. Chef Chris was massively accommodating and spent a long time going over the house menu with her to determine what would be the best. She first decided on a Chef’s cheese plate. It included a Colorado washed rind cheese, another cheese aged with thistle, a couple of other cheeses that were tasty but that neither of us can remember, and our favorite, a 5-year aged Roomano Gouda (pictured above). In addition were some excellent sweet and spicy pecans, some granny smith slices, and a tasty loaf of bread. Next up was the most memorable dish of the evening. A trio, starting with grape leaves filled with Japanese rice and tofu, continuing with shredded phyllo ketaifi barbecue shrimp, and finishing with baklava with Caribbean lamb and mirliton curry. The drink, Apollo’s Cup, was a blend of Plymouth gin, Fee Brother’s orange bitters, and Patron Citronage. I was amazed at how all of these flavors went so well together. I tried all different combinations of bites and sips, and they all just fit together. The chef’s passion and care were shown so many times by simple and kindly gestures. 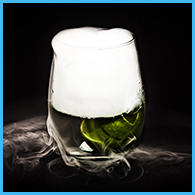 For this drink, he came around and added two bay leaves to each glass to enhance the aroma. As I mentioned before, the lighting made it nearly impossible for me to shoot good pictures, but I did my best. 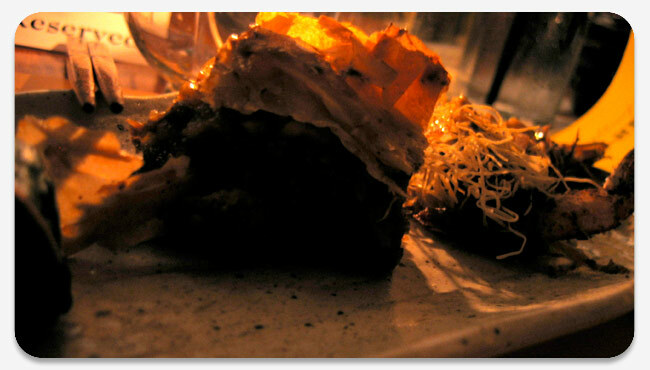 This dish is pictured above. The third course was a skewer of lightly-grilled shrimp, andouille sausage, and baby artichokes over creamy buckwheat polenta and topped with a spicy salsa verde. The drink was a blend of Plymouth gin, Chartreuse, and Cynar. When I told Paul that the drink wasn’t my favorite, he detailed an elaborate story about Arabian Knights and ethereal Chartreuse. The drink was still bitter, but I liked it more after such a passionate tale. Between courses, Gretchen received a delicious plate of Spanish roasted vegetables. A spicy pesto and warm goat cheese created a melange of yumminess. Next was a duet of salmon. The first, an ivory salmon, was marinated for days in miso and mirin, then slow-roasted. It was cooked to perfection. The second was poached salmon wrapped in dulse seaweed. Those of you who know me know that salmon and seaweed are two of the few foods I have yet to grow fond of. Though I loved them in this dish. The chef threw all his whimsical might into the cocktail paired with this dish. His description was so epic, I’m sure to have missed some of the ingredients. 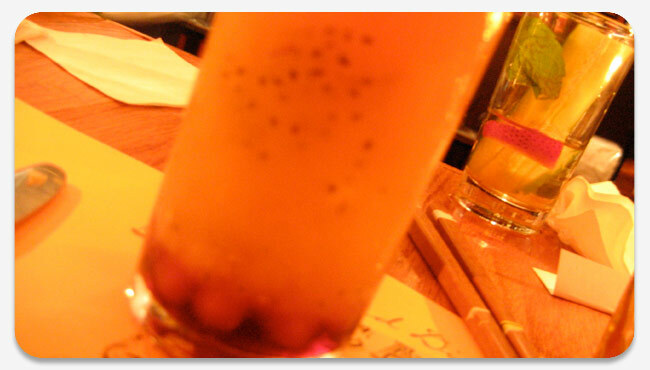 It was a five layered cocktail with kiwi, lychee, tapioca pearls, Momakawa sake, champagne, and about ten other things. It was amazing how balanced it was, and in my mind a nod to tiki’s ability to combine so many ingredients and achieve so much complexity, for sure. Finally, we finished with dessert. Traditional taiyaki pancakes, shaped like fish, were filled with a white peach mousse. The drink was a twist on one Paul posted about a while back, the Prince Parker Swizzle. The bartender was a workhorse the whole night, and I’m sure this one put him to the test. I noticed his attention to detail even when preparing sixteen of the same drink. Overall, chef Chris and mixologists Paul and Darcy did an awesome job putting together this meal. Gretchen and I both had a fantastic time; I know at some point in the evening I told her that if we lived in New Orleans, we’d have to visit the Delachaise at least once a month. She agreed. Chef Chris clearly loves what he does and made it clear by being part of the experience; he visited every table to make sure his guests were having a good time, and not just the obligatory one-time visit. He was out there the whole night crafting stories about his dishes and pairings and making it a jovial time for everyone. Thanks again guys for such an elegant and exciting dinner experience. Sounds like an awesome, tasty meal. I’m really jealous now. I will have to visit this place if I make it down to New Orleans!